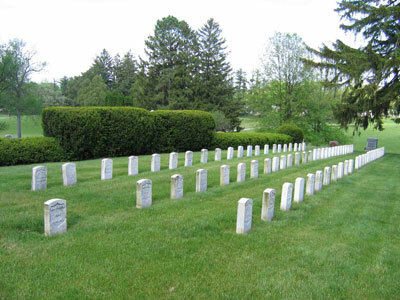 Oakdale Cemetery Soldiers' Lot, located three miles northeast of central Davenport, Iowa, is the final resting place for 71 Civil War soldiers, including the first Iowa casualties of the war. Established in 1857, the surrounding cemetery, now known as Oakdale Memorial Gardens, encompasses 78 acres. The cemetery is the burial place of many prominent local residents including several mayors, congressmen, and jazz great Leon Bismarck “Bix” Beiderbecke. During the Civil War, 174 soldiers were buried throughout the Oakdale Cemetery. In 1888, approximately 160 of the remains were reinterred at national cemeteries in Rock Island, Illinois, and Keokuk, Iowa. The remaining 14 burials were moved in 1900 to the Grand Army of the Republic (GAR) plot in Section 14 at Oakdale Cemetery. All subsequent soldiers’ graves in the cemetery are in this plot. The GAR transferred the burial plot to the Oakdale Cemetery Association in 1940, and the United States took possession of the plot the following year. The soldiers’ lot contains the remains of 71 Civil War veterans. Among them are seven soldiers killed during the February 1862 Battle of Fort Donelson, Tennessee, the first soldiers from Iowa to die in combat. The upright marble grave markers are arranged in three rows, running east-west, with a flagpole and plaque located at the center of the southern boundary/front of the section. The back of the lot is defined by a decorative hedgerow. Oakdale Cemetery Soldiers’ Lot is located within the confines of Oakdale Memorial Gardens, at 2501 Eastern Ave. in Davenport, IA. The soldiers’ lot is open for visitation daily from sunrise to sunset. No cemetery staff is present onsite. The administrative office is located at the Rock Island National Cemetery, and is open Monday-Friday from 7:30am to 4:00pm; it is closed Federal holidays except Memorial Day and Veterans Day. For more information, please contact the cemetery office at 309-782-2094, or see the Department of Veterans Affairs website. While visiting, please be mindful that our national cemeteries are hallowed ground. Be respectful to all of our nation’s fallen soldiers and their families. Additional cemetery policies may be posted on site. Visitors to Oakdale Cemetery Soldiers’ Lot may also be interested in Oakdale Memorial Gardens, which surrounds the soldiers’ lot. Oakdale Memorial Gardens is open Monday-Friday, 9:00AM to 4:30 PM or by appointment. For more information please call (563) 324-5121. Oakdale Cemetery Soldiers' Lot was photographed to the standards established by the National Park Service’s Historic American Landscapes Survey.